Have you always wanted to give yoga a try? There’s no time like the present to jump in, give it a go, and change your life for the better. Whether you’re 20 or 60, have been to a couple of classes or have never step foot on a mat, our beginner-friendly classes and beginner’s yoga courses are for you. Zama’s beginner’s yoga in Brisbane and Toowoomba is a fun and friendly way to kick start your yoga journey. Check out our Brisbane yoga and Toowoomba yoga timetable to find a beginner-friendly class near you. Or, visit our Brisbane yoga events page and Toowomba yoga events page to learn more about our upcoming beginners yoga courses. Beginner’s yoga: why practice yoga? Yoga is so much more than an exercise program – yoga is an ancient mental and physical practice that teaches us mindfulness and self-care, while keeping our bodies strong, flexible and healthy. A myriad of scientific research has uncovered the emotional, mental, and physical benefits of practicing yoga on a regular basis. 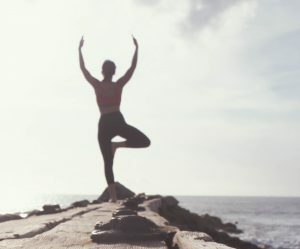 From stress to back pain, yoga can help alleviate discomforts, improve emotional well-being, promote mindfulness, and equip us with the tools we need to deal with life’s many pressures. Here is just a small sample of the benefits of practicing beginner’s yoga in Brisbane and Toowoomba. Feel the burn. Find the breath. Although some postures look quite easy, yoga will work deeply into your muscles. Using the weight of the body, beginner’s yoga will improve strength in the whole body, most importantly, in the core. While other weight-bearing exercises help us to build strength, yoga is a holistic exercise. As you grow stronger, you will not lose your flexibility or balance. Think you’re not flexible enough for yoga? Think again! There’s absolutely no such thing as not being flexible enough for yoga – even if you can’t touch your toes. As your flexibility increases, you’ll notice a reduction in aches and pains and an improvement in your posture. Maintaining your balance is so important – especially as we start to get older. Through mindful movement and mind-body connectedness, yoga improves our proprioception, that is, our awareness of our body in space. Better proprioception will boost our balance, reducing back and knee paint and the risk of falling. Most of us lead very busy lives. Our minds are bouncing from one thing to the next all day long, and when we curl into bed at night, it can be difficult to switch off completely. A racing mind can make it much harder to fall asleep. Practicing mindfulness and meditation through yoga, as well as learning pranayama (breathing practices), teaches us to consciously quiet our minds. Yoga teaches us to trust ourselves, to listen to and be guided by our body and our intuition. Yoga teaches gratitude, which in turn helps us make decisions that have a positive impact on our wellbeing. All of the classes at Zama’s Brisbane yoga studio and Toowoomba yoga studio are beginner-friendly. Our teachers are there to help you get the most out of your practice – they always provide options for those just starting out. Hatha. A traditional yoga practice that combines meditation, strengthening postures, balance postures, stretching, and relaxation. A fantastic all-rounder class, and an ideal introduction to yoga. Yin. Yin yoga involves deep stretches and long holds – it’s much more of a mental challenge than a physical one! Expect to hold each stretch for 3-5 minutes. Trust us, you’ll feel amazing afterwards. VinYin. 30 minutes of flowing vinyasa followed by 30 minutes of relaxing yin. VinYin is the best of both worlds. Warm slow flow. Heated to a gentle 28 degrees, this is a slow-paced class with an emphasis on finding what works for you. Beginner’s yoga courses. We host 6-week beginner’s yoga courses in Brisbane and Toowoomba. Find more information about our courses below, or on our Brisbane yoga events and Toowoomba yoga events pages. Check out our Toowong yoga timetable and Toowoomba yoga timetable for class times. It’s only natural to feel a little anxious about starting something new. The best way to approach your first yoga class is to come with an open and curious mind. Also remember that it’s your practice. Only do what feels right for your body, and don’t be afraid to ask the teacher if you’re not sure. Yes, yoga is about finding the breath, connecting the body and mind, and listening to your intuition. But, it’s also a lot of fun. Here’s a generic overview of a yoga class. While some beginner’s yoga classes in Brisbane and Toowoomba will follow this outline, others won’t. How the class is structured depends on the style of yoga, and the teacher. The variety keeps things interesting! Meditation, breathing practice, and gentle stretches to start. Standing postures that improve strength. Get aligned, adjusted, and aware! Whether you’re completely new to yoga, have been to a couple of classes, or have been practicing for a couple of months, our beginner’s yoga course will teach you the basics of yoga asana practice. During the course, we’ll break down fundamental yoga postures, and talk through correct alignment. We’ll touch on traditional yogic philosophy, and answer any questions relating to yoga that pop into your head. Beginners yoga courses in Brisbane and Toowoomba include six workshops over six weeks. By the end, you’ll feel confident and ready to attend all of our other yoga classes. Please note, our beginner’s yoga workshops are not heated. Head on over to our Brisbane yoga and Toowoomba yoga events pages to sign up for our next beginner’s yoga course. There’s no time like the present to start practicing yoga! If you’re in Brisbane, check out our Toowong yoga studio timetable, our Brisbane yoga events page, or contact the studio on 07 3162 1652. If you’re in Toowoomba, check out our Toowoomba yoga studio timetable, our Toowoomba yoga events page, or contact the studio on 07 3162 1652.